How does this CEREC technology work? Imagine a dental practice where you can go and have your new false tooth made and fitted during a single visit and within an hour. This is what CEREC technology by Sirona Dental Systems UK has made possible. CEREC is a revolutionary system that enables your dentist to design, fabricate and fit a new crown, veneer, onlay or inlay in a single visit, a procedure that would normally take at least two weeks, if not more! CEREC computerised design unit (left), and milling unit (right). Your dentist will prepare your tooth in the normal way he/she would before fitting a crown or a veneer. At this point, instead of using "dental putty" to take an impression of your tooth, a digital image is taken using a special camera. This image is then converted into a 3D computerised model of your tooth, which is used as a guide to design your new restoration. 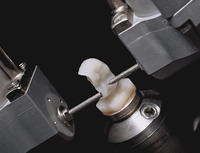 Once your dentist is happy with the newly designed tooth, this data is sent to an onsite milling machine, which fabricates your new tooth from a high-quality ceramic block. The milling process can take anywhere from as little as 6 minutes to 30 minutes depending on the exact technology and complexity of the tooth. 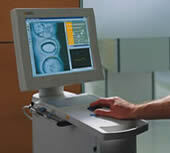 The latest CEREC MCXL machine can mill a crown in as little as 6 minutes. The ceramic blocks come in a wide variety of shades and colours, and your tooth will be selected to match your surrounding teeth. Once the crown or veneer has been milled, the dentist may characterise it and stain it to match your surrounding teeth, before either polishing it or glazing it in a furnace. Your new restoration will then be cemented into place onto your prepared tooth. Thank you to Dr Kailesh Solanki for providng the above photos where 17 CEREC crowns and veneers were fitted in a smile makoever case to repair worn down and discoloured teeth. 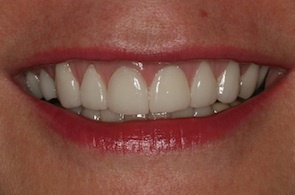 Large metal fillings replaced with CEREC fillings. Everything is carried out in a single visit - you only need to visit the dentist once - take one day away from your work or life to have the procedure - instead of the usual two or three visits. Only one set of local anaesthetic injections - since the entire procedure can be carried out within the hour, you only need to have one lot of injections. Your dentist is in complete control of the final result - since the crown or veneer is designed and fabricated from start to finish by your dentist, he/she has total control over how it will look and fit, whereas a crown made in a laboratory is under the control of the technician who hasn't even seen the patient. No temporary restorations - if you have lab-made veneers, you would require temporary veneers during the wait for your new teeth. 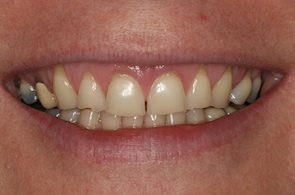 These have been known to fall off and cause problems, which is a step that is omitted with CEREC restorations. How much does CEREC cost? You would probably think that restorations made with this state-of-the-art technology would cost a lot more than standard lab-made veneers and crowns. However, there is often very little - if any - difference in price, because you only need one appointment with the dentist and there are no laboratory fees to incorporate into the price of your treatment. CEREC crowns can vary in price from as little as £380 up to £700+ per tooth. Many dentists offer interest-free finance plans to help spread the costs of your treatment. CEREC MCXL milling unit, first piloted in the UK by Dr Kailesh Solanki at Kissdental. It fabricates crowns in as little as 6 minutes.